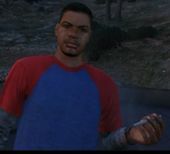 Felipe is a character in the HD Universe appearing as a minor character in Grand Theft Auto V.
Felipe is from a wealthy family and a regular customer of the Downtown Cab Co. in Los Santos. He is an adrenaline junkie who, during one property side mission, is driven by Franklin Clinton to the Vinewood Sign in Vinewood Hills to meet his friends, who dislike Felipe and do not invite him along to their activities. Franklin picks him up from the Mount Zonah Medical Center, having attempted to free climb up the Arcadius Building and falling from the first storey, after he discharged himself against doctors orders as they believed he was bleeding internally. On the way he encourages Franklin to drive erratically, drive off road and cause collisions. His 'friends', however, are not at the location when he arrives and he decides to wait on top a silo, convinced they will arrive. This page was last modified on 16 December 2013, at 17:25.